The Great Lakes make up 21% of the world's fresh water source and have seen their share of shipwrecks. 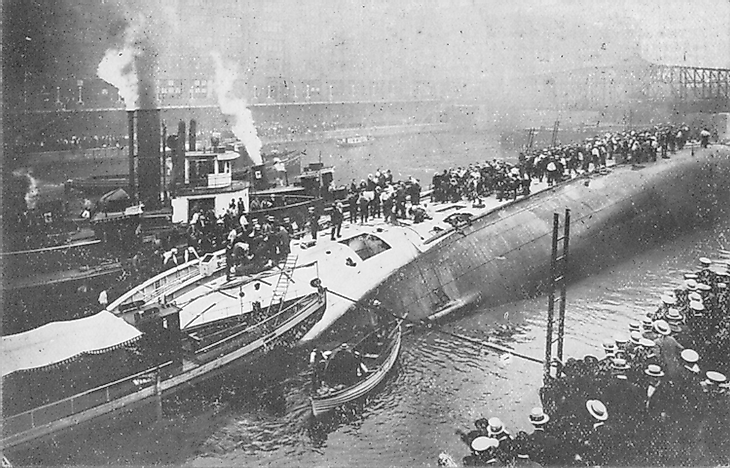 View of SS Eastland from the south side of river after the accident. The Great Lakes are a group of freshwater lakes that are all interconnected with one another. The five lakes of Superior, Michigan, Huron, Erie and Ontario make up 21% of the world's surface fresh water and are among the most well known lakes in the world. The Great Lakes cover parts of the two Canadian provinces of Ontario and Quebec and seven different states in the United States, from Minnesota to New York. They are known for their importance in transportation, aquatic biodiversity and having such a sea-like quality that they have been referred to as inland seas. This last trait has caused many shipwrecks to take place in the Great Lakes in recorded history. The SS Eastland was a Great Lakes passenger steamer, that along with four other steamers, had been hired to transport employees in Cicero, Illinois (who worked at the Hawthorne Works factory) to a picnic in Michigan City, Indiana. Prior to the fateful July 24, 1915 journey, there were claims that the ship had design flaws. This was not helped by the new 1915 federal Seamen' Act which required a complete set of lifeboats to be on many passenger vessels, making the ship's problem of being top-heavy worse since the ship already had to have special restrictions on the number of passengers it could hold. Shortly after seven in the morning, the ship had reached its capacity of 2,572 passengers, with the majority on the upper decks. The ship then began to tilt a little towards its port side, despite the crew's attempt to stabilize it. At some point during this a number of passengers rushed to the port side of the ship and the SS Eastland rolled over completely onto its port side. Despite only being about 20 feet from the wharf in the south bank of Chicago River and the fast acting response of a nearby ship that helped stranded passengers, the death toll was 844 people. The SS Eastland is the worst shipwreck to take place in the Great Lakes in terms of the number of casualties. The SS Edmund Fitzgerald was a freighter that had carried ore across the Great Lakes for 17 years. The ship was known for its size, seasonal haul records, and its ability to entertain boat watchers with its piping music and commentary. On November 9, 1975, the ship embarked on what would be its last voyage, from Superior, Wisconsin towards Detroit, Michigan. The day after the ship left it was caught in a severe storm that matched a hurricane in wind speed and wave height that were as high as 35 feet. The ship sank shortly after 7:00 p.m. despite no distress signals, with all 29 of the crew perishing. The cause of the sinking is still unknown, but there are a number of theories as to what caused it like a rogue wave or flooding of the cargo hold. The SS Edmund Fitzgerald is the largest ship to have sunk in the Great Lakes. The Great Lakes Storm of 1913 was a blizzard that rocked the Great Lakes Basin with hurricane level winds and giant waves over a three day period from November 7 to 10. The storm was the deadliest and most destructive natural disaster to ever affect the Great Lakes and it was particularly devastating for ships. The total financial loss for all the ships and their cargo was almost $5 million, which would be about $122 billion today. In total major shipwrecks took place on all the Great Lakes but Ontario. A total of 12 ships were shipwrecked, 30 ships were stranded and there were around 300 fatalities. Three of the twelve ships that sank have never been found. How Many Shipwrecks Are There?